©2019 BREEZE PUBLICATIONS INC. Serving Pawtucket Breeze THE VALLEY FREE MARCH 20-26, 2019 PAWTUCKET – Leslie Moore, who purchased The Grant at 250 Main St. last year, understood that creating something new there might require taking some steps backward. Moore remains enthusiastic about the prospects for this old- time indoor mini mall-like build- ing, which she says will soon have attractions where visitors can shop, eat, and be entertained. The goal, she said, is to have "food, things to do, and things to buy" all in one place. These are the reasons people go outside their home and to a down- town, she said, and the new version of The Grant will give them what they want. One of the first steps Moore took upon purchasing the prop- erty was to inform tenants in the 18,000-square-foot building that there would be a new approach at The Grant. Those tenants who did decide to stay would need to cre- ate a component to attract visitors. As she shared with them her hopes for the facility, those that operated independently and weren't going to establish that public aspect were told that they were "not a long- term good fit," she said. Moore and her team are in talks with a number of tenants. She plans two of the most significant attractions here to be an arcade and a restaurant/coffee shop. The eatery would be located in the right front window space previously Arcade, streetfront eatery among planned attractions at The Grant By ETHAN SHOREY Valley Breeze Managing Editor ethan@valleybreeze.com LESLIE MOORE, owner of The Grant on Main Street, is planning a vibrant mix of tenants. The Grant will offer visitors chances to eat, be entertained, and shop. BREEZE PHOTO BY ETHAN SHOREY THE GRANT, at 250 Main St., is sched- uled to have a grand reopen- ing in May as a mixed-use attraction and business incu- bator space. 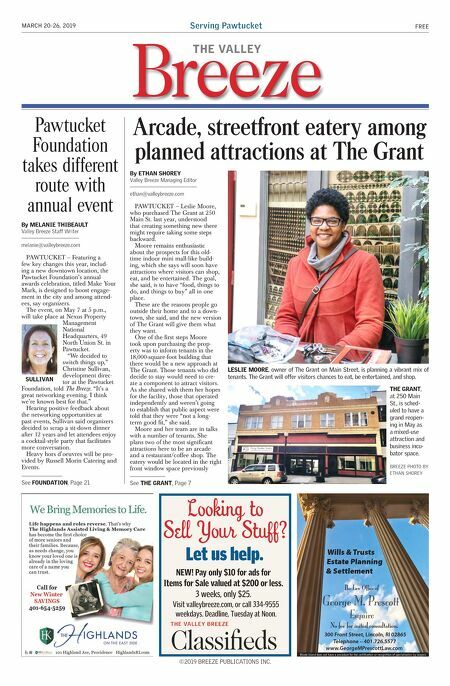 See THE GRANT, Page 7 PAWTUCKET – Featuring a few key changes this year, includ- ing a new downtown location, the Pawtucket Foundation's annual awards celebration, titled Make Your Mark, is designed to boost engage- ment in the city and among attend- ees, say organizers. The event, on May 7 at 5 p.m., will take place at Nexus Property Management National Headquarters, 49 North Union St. in Pawtucket. "We decided to switch things up," Christine Sullivan, development direc- tor at the Pawtucket Foundation, told The Breeze. "It's a great networking evening. I think we're known best for that." Hearing positive feedback about the networking opportunities at past events, Sullivan said organizers decided to scrap a sit-down dinner after 12 years and let attendees enjoy a cocktail-style party that facilitates more conversation. Heavy hors d'oeuvres will be pro- vided by Russell Morin Catering and Events. Pawtucket Foundation takes different route with annual event By MELANIE THIBEAULT Valley Breeze Staff Writer melanie@valleybreeze.com See FOUNDATION, Page 21 SULLIVAN Wills & Trusts Estate Planning & Settlement The Law Office of George M. Prescott Esquire Rhode Island does not have a procedure for the certification or recognition of specialization by lawyers. 300 Front Street, Lincoln, RI 02865 Telephone – 401.726.5577 www.GeorgeMPrescottLaw.com No fee for initial consultation. NEW! Pay only $10 for ads for Items for Sale valued at $200 or less. 3 weeks, only $25. Visit valleybreeze.com, or call 334-9555 weekdays. Deadline, Tuesday at Noon. Looking to Sell Your Stuff? Let us help.